RHC Lifting had to overcome a number of technical challenges to meet GKN Aerospace’s specialised requirements. The equipment represents RHC Lifting’s biggest order to date. The new GKN Aerospace manufacturing facility in Western Approach will be the focus of the company’s Airbus A350 XWB work, producing the rear wing spars and trailing edge assemblies for the new aircraft. Production is scheduled to start at the end of this year. To aid GKN's semi-automated manufacturing operation, RHC Lifting, based in Bristol, UK, designed, manufactured and installed two SWF Krantechnik branded multi-latching crane systems. Each system has a span of 32 m, across three bays, with cross travel speeds of 5 m/min, long travel speeds of 40 m/min, and hoisting speeds of 0.83-5 m/min. System One, located in the Clean Room, has three 10 tonne SWF top running single girder latching cranes and two tandem pairs of 5 tonne SWF Nova low headroom hoists. Each bay has a gantry length of 41 m with one transfer point in each bay. System Two, located in the Assembly Area, has five 6.4 tonne SWL top running single girder latching cranes and four pairs of tandem 3.2 tonne SWF Nova low headroom hoists. Each bay has a gantry length of 104 m with five transfer points. 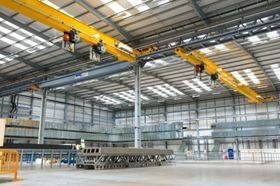 To ensure the cranes met with the specialised requirements for the manufacture of composite structures, RHC Lifting incorporated a number of features into both systems, including: inverter drives on all motions, including hoisting, for smooth and precise movement; anti-collision and exclusion zones to ensure components move around the facility safely; load displays, reeling drums and digital outputs to allow vacuum lifting beams to be fitted in the future. All crane beams and hoists have their own Siemens PLCs, which are all controlled, wirelessly, by a floor mounted Siemens central control safety PLC. This allows all hoists to travel on any crane beam on the system. Two floor mounted Siemens HMI screens will display schematics of the systems, including information on loads, current locations of crane beams or hoists, as well as basic maintenance diagnostics. Seven Autec C26PRO radio remotes will allow GKN Aerospace employees to capture and release cranes and hoists, increasing the efficiency of moving loads between different processes in the facility. Now the cranes are operational, RHC Lifting will provide GKN Aerospace with after sales care including operator training, servicing, and statutory inspections. It will also provide 24/7 breakdown cover for the two year warranty period.